Mozart, Wolfgang Amadeus, 1756-1791. Concertos, piano, orchestra, K. 537, D major . Concerto for piano and orchestra no. 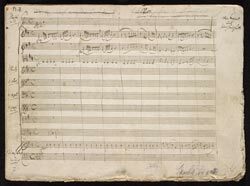 26 in D major, K. 537 : autograph manuscript, 1788 Feb. 24?